Super super duper excited to finally launch these dresses! This is the start of a year of exciting projects. 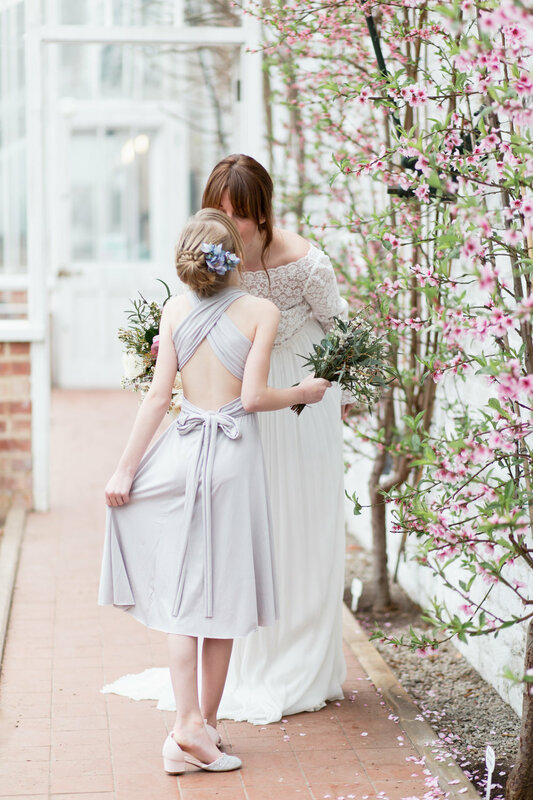 Eco Friendly Bridesmaid dresses with gorgeous twirling skirts! Made in our Cheshire studio from bamboo jersey we have created 13 colour options for bridesmaids in multiway dresses. This is a more sustainable alternative to the traditional polyester version and so much nicer against the skin. Breathable bamboo fabric is lovely, soft and comfortable. We have a range of skirt lengths and colour ways and whilst we were designing this collection we chose styles and colours that would be suitable for wearing again. Zero waste! A more sustainable fabric is a great choice but have a dress you can wear many times over after the wedding is even more sustainable. We use organic cotton tread to sew these dresses and the electricity is provided by 100% renewable energy. The pricing of the dresses reflects the cost of a more sustainable fabric and ensures at minimum a living wage is paid for the making. Depending on your colour choice the bamboo content and dyes vary, some are 94% bamboo and 6% spandex (to give the stretch) with non certified dyes and some are 66% bamboo, 28% organic cotton and 6% spandex with eco certified dyes. We hope to move the collection to all eco dye options depending on colours available and which options are popular. These dyes do not produce harmful chemicals or environmental pollution, therefore, comply with environmental regulations. Eco dyes are non-carcinogenic and are free from or produce no harmful aromatic amines or acute toxins. Choose from Maxi length, midi, high low and knee length, each one a circle skirt so it drapes beautifully and twirls when dancing. Also fits over baby bumps! And we haven’t forgotten the little ones! We have an extra small version for those young bridesmaids that want to look like their older counter parts. So if you are in need of bridesmaid dresses then shop online now! Turn around is 8 weeks or sooner so don’t leave it until the last minute. And as a special launch offer we have 10% off your order until the end of the month. Use code - NEWMAIDS15 but hurry as we can only make so many a month the code is limited!